For an unforgettable agritourism holiday, discovering the province of Syracuse is sure to be a successful choice. Although there are dozens of testimonies confirming the beauty of Syracuse, two of these are particularly significant. The first is Cicero's famous claim: he called it "the greatest Greek city and the most beautiful of them all." The second endorsement is more recent: the UNESCO declaration that designated the Sicilian city as a World Heritage Site. 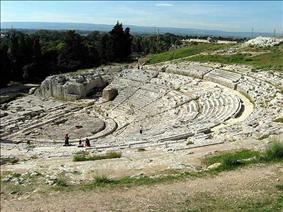 Syracuse's charm is the result of a complex alchemy that combines a dazzling sea with a unique archaeological area. The Greek Theatre is the city's undisputed symbol. Built around the 5th century BC, it is divided into nine segments, each dedicated to a deity. In Roman times it was also used for gladiatorial combat, but the trenches we see today are a reminder of the Spanish, who misused the theatre by installing water mills there. Today the theatre once again provides a magnificent setting for strongly evocative classical performances. You can almost feel a dark power of attraction in the quarries known as the "Latomie". The stone blocks once mined here were used for the construction of public buildings and private residences; after mining ceased, the caves were turned into prisons. Legend has it that in 413 BC, seven thousand captured Athenians were held here and the only ones to survive were the few who could recite Euripides' verses by heart. The most famous 'Latomia' is Paradise, formed by a group of quarries around which a lush garden flourished. When the great painter Caravaggio visited here in the early 17th century, he named one of the caves "Dionysus's Ear" in reference to the traditional belief that the tyrant Dionysus the Elder used to eavesdrop on his enemies' plans by listening to the echo. There is so much to see in Syracuse that you'll need to have comfortable shoes and a heart open to beauty. This way you'll be ready to wander in the Ortigia neighbourhood, the historic heart of the city where the remains of the Temple of Apollo and Artemis are located, the oldest Doric temple in the region. Don't miss the majestic Byzantine Cathedral with its splendid sculptures of the Virgin Mary, St. Lucia and St. Marziano on the richly decorated façade. Inside is a reminder of the city's Greek past, preserved in the form of Doric columns from the Temple of Athena. If you have the time, do visit Villa Ladonia, home of the Paolo Orsi Regional Archaeological Museum which holds over fifteen thousand unique works. The province of the beautiful city of Syracuse contains many pleasant surprises too. Just over 40 km away is Ferla, a pretty town full of traditions and culture. The local people are particularly devoted to St. Sebastian, their patron saint, and organise solemn celebrations and fascinating rituals for his feast day on July 20. The day before the feast they hold the so-called curruta, during which the statue of the saint is carried in procession through the streets accompanied by the joyful cries of the faithful. At first light on the feast day itself, cannon shots are fired to gather people to morning Mass where they offer a votive candle. The men carrying the fercolo (the conveyance used to carry the statues of saints in procession) decorate their bare chests with the image of St. Sebastian. Later that evening the saint is once again carried in procession, this time on a cart drawn by children. A firework display follows, turning the Ferla night into the brightness of day. This powerful pageant embraces faith and folklore in a single celebration. But to give even an ordinary day the solemnity of a feast day, just try the exquisite Syracuse cuisine, with specialities such as fresh fish or excellent dishes based on the famous local sausage. Then round things off with some unmissable ricotta cannoli or some homemade ice cream, the pride of the area. Like an old black and white film, a holiday in Syracuse is full of the distant echoes of traditions: the artistic heritage of a glorious past and the genuine flavours of a bountiful area that never fails to stir the emotions. Although the expression "to have a sword of Damocles over one's head" is commonly used today to express an uncertain situation and a fear of danger lurking, not everyone knows that it actually derives from Cicero's story of a certain Damocles, an obsequious prince at the court of Dionysius II, the tyrant of Syracuse. When Damocles was in the tyrant's presence he was continually flattering him on his good fortune to have all his power and wealth. Dionysius therefore decided to invite him to a marvellous banquet, in the course of which Damocles experienced the immense privileges the tyrant enjoyed. It was only at the end of the dinner that he noticed a large sword hanging by a single horsehair above his head. The tyrant had had it put there to make Damocles aware of the delicate position occupied by any powerful man: a position constantly exposed to every kind of threat. And so it was that Damocles instantly quit envying the tyrant and his "fortunate" situation.